Millennialist or so-called Premillennialist writers were Apollinaris, Commodianus, Hippolytus, Irenaeus, Justin Martyr, Lactantius, Methodius (who saw the millennium as a day of judgment), Montanus, Nepos, pseudo-Barnabas, Tertullian and Victorinus. The theory of the delayed 70th week relating Daniel 9:25 to Christ was first introduced by Hippolytus. 1-3 Those years wherein Satan is bound are in the first advent of Christ, even to the end of the age; and they are called a thousand, according to that mode of speaking, wherein a part is signified by the whole, just as is that passage, "the word which He commanded for a thousand generations," although they are not a thousand. Moreover that he says, "and he cast him into the abyss," he says this, because the devil, excluded from the hearts of believers, began to take possession of the wicked, in whose hearts, blinded day by day, he is shut up as if in a profound abyss. And he shut him up, says he, and put a seal upon him, that he should not deceive the nations until the thousand years should be finished. "He shut the door upon him," it is said, that is, he forbade and restrained his seducing those who belong to Christ. Moreover, he put a seal upon him, because it is hidden who belong to the side of the devil, and who to that of Christ. For we know not of those who seem to stand whether they shall not fall, and of those who are down it is uncertain whether they may rise. Moreover, that he says that he is bound and shut up, that he may not seduce the nations, the nations signify the Church, seeing that of them it itself is formed, and which being seduced, he previously held until, he says, the thousand years should be completed, that is, what is left of the sixth day, to wit, of the sixth age, which subsists for a thousand years; after this he must be loosed for a little season. The little season signifies three years and six months, in which with all his power the devil will avenge himself trader Anti-christ against the Church. Finally, he says, after that the devil shall be loosed, and will seduce the nations in the whole world, and will entice war against the Church, the number of whose foes shall be as the sand of the sea. 4, 5 There are two resurrections. But the first resurrection is now of the souls that are by the faith, which does not permit men to pass over to the second death. Of this resurrection the apostle says: "If ye have risen with Christ, seek those things which are above." 6 I do not think the reign of a thousand years is eternal; or if it is thus to be thought of, they cease to reign when the thousand years are finished. But I will put forward what my capacity enables me to judge. The tenfold number signifies the decalogue, and the hundredfold sets forth the crown of virginity: for he who shall have kept the undertaking of virginity completely, and shall have faithfully fulfilled the precepts of the decalogue, and shall have destroyed the untrained nature or impure thoughts within the retirement of the heart, that they may not rule over him, this is the true priest of Christ, and accomplishing the millenary number thoroughly, is thought to reign with Christ; and truly in his case the devil is bound. But he who is entangled in the vices and the dogmas of heretics, in his case the devil is loosed. But that it says that when the thousand years are finished he is loosed, so the number of the perfect saints being completed, in whom there is the glory of virginity in body and mind, by the approaching advent of the kingdom of the hateful one, many, seduced by that love of earthly things, shall be overthrown, and together with him shall enter the lake of fire. 8-10 This belongs to the last judgment. And after a little time the earth was made holy, as being at least that wherein lately had reposed the bodies of the virgins, when they shall enter upon an eternal kingdom with an immortal King, as they who are not only virgins in body, but, moreover, with equal inviolability have protected themselves, both in tongue and thought, from wickedness; and these, it shows, shall dwell in rejoicing for ever with the Lamb. St. Victorinus, the bishop of Petah, wrote a commentary on the book of Revelation in 270 AD. He said he saw another great and wonderful sign – "Seven angels having the last seven plagues, for in them is completed the indignation of God. And these shall be in the last time when the church shall have gone out of the midst." In other words, St. Victorinus was talking about the Rapture! This teaching is not a present day innovation but a doctrinal statement dating back 17 centuries to St. Victorinus and 20 centuries to Jesus and Paul. The earliest consecutive commentary on the Book of Revelation. 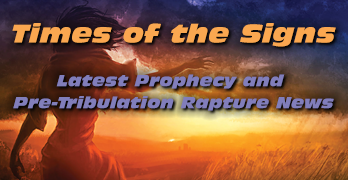 The seven plagues of Revelation 15:1, Victorinus explains, ‘shall be in the last time.’ then he adds, most significantly, ‘when the Church shall have gone out of the midst,’ indicating that he knows about the rapture and that it is to precede the Great Tribulation. The original text of Victorinus’s commentary on the Apocalypse was not published until 1916. Before that date scholars and translators had to rely on an earlier edition in which the crucial section covering Revelation 20:1-10, with its description of the Millennium, as well as the remainder of Chapter Twenty and Chapters Twenty One and Two, has been replaced by a spurious interpolation. In it a post-millennial interpretation is advanced which runs counter to all that we know of Victorinus’s views. The authentic version, however, is now available and reveals Victorinus as a convinced pre-millennialist.